Domino Ring, Very Rockabilly and Mod. Very Jessie J and Cher Lloyd. 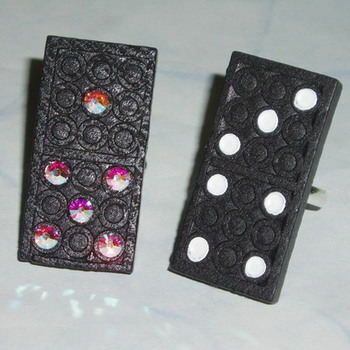 Black wooden Domino is securely attached to a silver plated ring base. Swarovski crystal option available. 2 sizes of ring to choose from. These are so in fashion just now so get yours before they all sell out. Domino will be chosen at randon from the set. If you want a particular number, please leave a note and I will try to fullfill your request.